We stood before the entrance with an uncertainty that arises when you’re not quite sure you did the right thing by coming there, when it’s vastly different from what you had baselessly imagined. It took 2 whole minutes for that to change, with the re-assurance of a choice well made. We were greeted by trumpets and drums, and by an elderly gentleman who would have made a good village headman in a Hindi movie, holding a plate with the traditional welcome items like rose-water, kumkum, flowers and rice. If you’re also a tourist and are really in the mood for some Indian Maharajah treatment, you will also be honored with a pagdi (a type of headgear) and a chain of pearls! Welcome to Dhola ri Dhani, the Rajasthani theme resort (for want of a better word) located on the outskirts of Hyderabad. Although the term ‘outskirts’ is hugely debatable, the drive from our workplace to Dhola ri Dhani (hereinafter referred to as DRD owing to the author possessing a high level of laziness in her blood) through non-existent roads and villages sure made it seem like the middle of nowhere. Thanks to an over-zealous taxi driver who was pretty sure he knew what he was doing even when the car had to go over mounds of mud and sand – we could have been in the middle of a river being dug up and we wouldn’t have known! 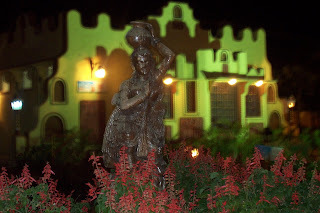 The ambience in DRD is typical Rajasthani – or so they say. I wouldn’t know ‘coz I haven’t been to the Northwestern Indian state. All I can think of about Rajasthan is desert, a lot of camels, Udaipur-Liz Hurley-Arun Nayar-wedding and Rudali. And BITS, Pilani. And hey, more recently, Eklavya! For a person like that, this is quite an experience. You’re welcomed by Rajasthani folk music blaring from unseen speakers which, although quite endearing in the beginning, starts to get to you after a while and you just wish you could strangle the voice singing it and end the misery once and for all. We (‘we’ here refers to a team of 15 people who’s only intention in coming to DRD was to have absolute, unadulterated fun. And ofcourse, food. Oh wait, maybe that’s just me!) took a walk around the place, waiting for the rest of the team to turn up. And what we saw left us saying, ‘Hmm..that’s nice’. There was a temple (which we conveniently did not visit), a bit of open lawns with those cots that one would find at a dhaba, lots of mosquitoes and the omnipresent folk song on the speakers. If you’re a kid in body and soul or a kid in soul inside that rough-looking exterior, you could sit on the swing (which was pretty sturdy, I must say) or play see-saw with an equal weighing companion. You could also play a local version of bowling involving 3 golf-ball sized balls and a stack of steel tumblers. You get to pick artsy trinkets if you can unstack all the tumblers. Or you could totally miss all the tumblers, even if you’re standing 5 feet from it. What’s important is you had fun. Fun, ladies and gentlemen, is the essence of living. (I’m shortly coming out with my own Book of Profound Lines, stay tuned!). I swear the camel smiled! One of the things we realized about the place is that it can keep you occupied for an entire evening. There is a camel ride, if you like sitting on a moving stinky mountain and feel like royalty, even if its only for 10-15 minutes. 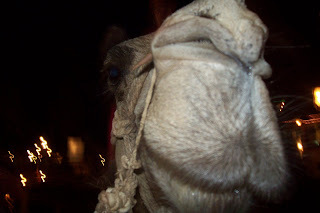 And even if the rest of my team does not agree, I really think the camel smiled. Or maybe that’s just the way a camel looks (more probable, isn’t it? Ho hum.). We girls got some mehendi on our hands from the resident mehendi artist. If you’re a guy, there’s nothing you can do but feel left out (or you can go right ahead and get some yourself – whatever makes you happy, chum!). 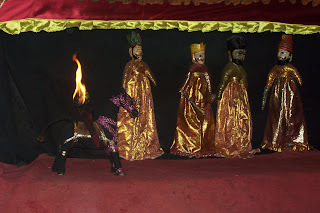 There were puppet shows and folk dance recitals (which we successfully stage-crashed at their invitation) that were really nice, these guys have some talent and it’s a pity they don’t have a larger audience. And if you’re a hindi movie buff, worry not! there is an in-house production of Sholay in nothing less than Hyderabadi Hindi! Get ready to hear Gabbar say ‘Jab tak tumhare pairaan nachte, iski saasen chalta’. I walked out of the amphitheatre (?!!) thanking my stars that they staged only the climax scene. Thank God for small mercies. The highlight of our trip to DRD were two things that I haven’t mentioned till now. Best for last, you see. One, the food. Oh. My. God. Three different types of roti (bajra, missi, regular chapati), 4 curries to go with, dal baatis, dahi vadas, the yummiest jalebis, misri, papad and the I-totally-loved-it kichdi made of bajra and rice with ghee and sugar! This is my kind of paradise! ‘Drool drool slurp slurp’ would be a gross understatement. You’d feel full if you just taste the umpteen number of things on your plate. So much so, I didn’t even notice my right leg going numb due to lack of blood circulation for we were sitting down and eating, a la Rajasthani isstyle. Finish the whole thing off with buttermilk, which I should say had a tad too much of coriander leaves and don’t know why, tasted a bit like Hajmola! I guess I need some getting-used-to for the North Indian platter. The second highlight was the magic show. It was mind boggling! This guy was right in front of us doing the most amazing of tricks, and we were mute spectators to the whole show! Well, almost mute – we did have to shout meaningless jargon, abracadabra and poo-poo (not to be confused with baby language please) and assorted actions that included coughing, sneezing and a certain action involving a ball and a bag between one’s legs. I refrain from elaborating further on that and you’re forbidden to ask me. What mattered, as always, was we had fun! And the last trick of the day? How about rubbing fists with your neighbor and choosing your favorite flower, only to come back with the smell of the exact same flower on your fist! I’m almost on the verge of believing that there is such a thing called magic and, wait for this, Harry Potter could be real! Now that, dear people, is what I call the essence of living! On that note, also by popular demand from colleagues, presenting…the smoking camel! 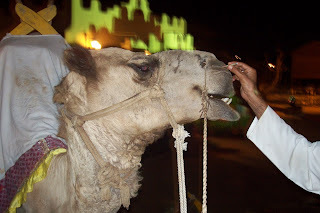 Apparently, the aforementioned camel can smoke beedis very expertly! Rudali – That beautiful movie which tells the poignant tale of a woman who could never shed a tear but who finally ends up a Rudali – women who are paid to cry at funerals. That movie where we saw a never-before never-after Dimple Kapadia playing Sannicheri. The same movie where Bhupen Hazarika’s songs cast a spell on us, bringing the despair of the sandy desert into our hearts. I was so kicked, I took about 40 pictures. Awright that’s an exaggeration. I did them halfway up my hands, but they washed out in a months time. That was nice to read. So the next time I land HYD,I’m gonna make sure I visit the place. btw is it a hindi movie ?? documentary sorts ?? The Mehendi looks “WOW” in ur hands 🙂 It’s been ages since i wore Mehendi in my hands too !! @ nithya…. scorpions???? sheeesh!!! more like an anvil!!! Nithya – I forgot! They did serve jaljeera (which again, tasted like hajmola!). ‘Rudali’ is a beautiful movie, even got nominated for an Oscar I think..and yes, they have customs in Rajasthan where if the person who died doesnt have any close family, then there are women who come and cry. Beautiful movie. 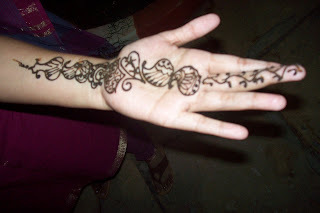 And mehendi is strictly feminine, at least for me! 😉 So the guys will just have to feel left out! Sharan – Happy Ugadi to you too! and yeah, the food was more than delicious! loved it. SO u had a gr8 outing.. i too went to an outing i like non veggie cuisines more but tat time was on a fast but the resort i went had so much non veg delicacies.. Damn tats wat i cal as fate.. bsides tat resort dint have many features like wat u said.. lucky u i think u got a good team i guess.